Oil on canvas, 104 cm x 149 cm. In 2017 the Seattle Art Museum pulled off the considerable coup of acquiring this iconic painting by Louis-Philippe Crépin, which depicts a tragic incident from the voyage of La Pérouse which took place in Lituya Bay in Alaska on 13th July 1786. 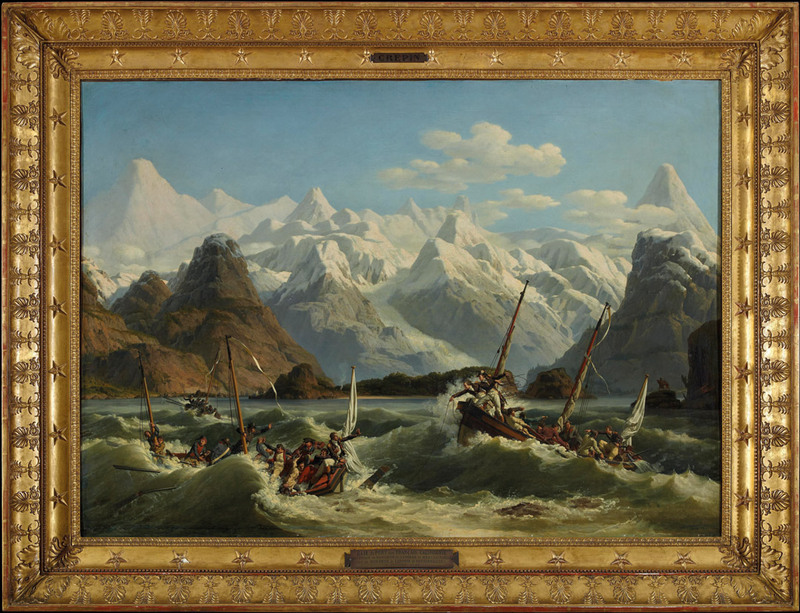 Against an awe-inspiring backdrop of mountains and glaciers, two ship's boats were dramatically overwhelmed by the sea, with the loss of twenty-one lives. 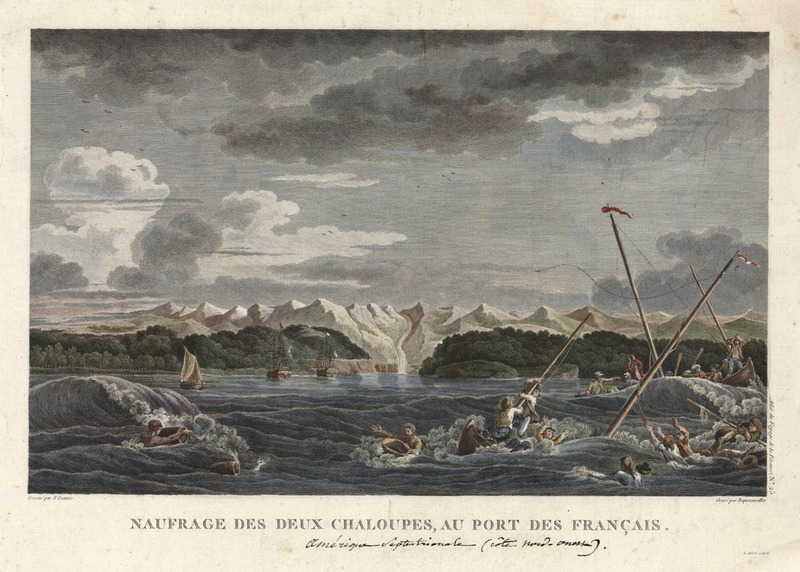 Among those drowned were the two sons of the wealthy financier, the marquis Jean-Joseph de La Borde, sponsor of the expedition and a personal friend of La Pérouse. The elder brother Edouard-Jean-Joseph de la Borde Marchainville (b.1762), "tall, blond, and well instructed in navigation" was a lieutenant on board the Astrolabe; the younger Ange-Auguste-Joseph de la Borde de Boutervilliers (b.1766) a naval cadet. According to legend Marie-Antoinette herself had prevailed on La Pérouse to take them both with him. Lengle as commander of the Astrolabe, made it his "inviolable rule" never to allow them in the same party, but on this occasion he had made an exception; he saw the excursion "as little more than a party of pleasure, in which the boats would be no more exposed to danger than in Brest Road in fine weather". In a letter of 22 September 1786, he wrote to his mother, "I had the indelible pain of seeing perish MM. de Laborde, the brothers, M. de Flaissan and seven men from my crew in the same boat." When news of the incident reached France France in May 1787, it had a considerable impact: it seemed a psychological turning point had been reached, giving the lie to Louis XVI's pledge that the voyage should succeed "without costing the life of a single man." Crépin's painting was commissioned in 1806 by Alexandre, marquis de Laborde (1773-1842), the brother of the two drowned officers, a soldier, diplomat and well-known man of letters. It was much praised in the Salon of 1806 and was reproduced as a lithograph. The picture remained in the Laborde family, but found its way to Spain in the late 19th century. It was sold in a private sale by Christie's London in 2017. 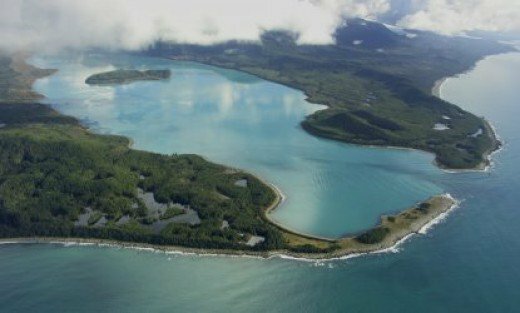 After some difficulty they found safe anchorage, in order to replenish supplies of wood and water, trade with the local Tlingit Indians and begin the task of charting and exploration. 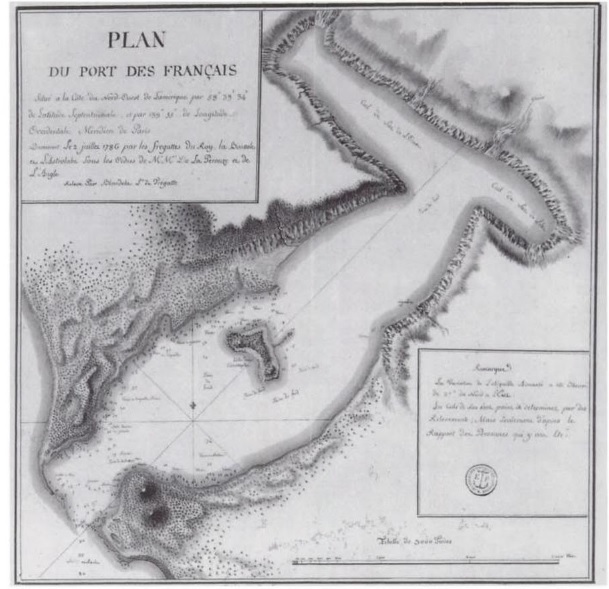 It is possible that La Pérouse had secret orders to reconnoitre the site for a French “factory” - this would explain why he notionally purchased the island in the centre of the Bay from the natives and went through an “act of possession” by burying a claim in a bottle. He installed an observatory, the third of the voyage. Two boats were sent out to explore the bottom of the Bay to see if there was a passage through. In fact the Bay ends in a T-shaped wall of rock and ice in two basins blocked by immense glaciers. The boats had to brush aside chunks of ice as they progressed. Langle and several officers climbed onto the glacier, but "all they could see was a continuous mass of ice and snow that must have reached up to the very summit of Mount Fairweather". La Pérouse beached his boat only to have it swamped and thrown for some distance along the face of the glacier after a huge piece of ice broke off. The party was soon forced to acknowledge the futility of the venture and return to the ships. In mid-July, with the ships ready to leave, it was decided at the last minute to take a final set of soundings to complete Bernizet 's chart of the inlet. Early on the morning of the 13th July La Pérouse sent a detachment of officers and seamen in two biscayennes (pinnaces) and a jolly-boat, to take soundings at the entrance to the bay. Despite written instructions to be prudent, Lieutenant Descures, who led the operation, went too close to the entrance which is narrowed by a long bar [the La Chaussee spit]. His boat was carried away by the current and swamped. The second pinnace, which went to his aid, suffered a similar fate. Modern commentators emphasise the treacherous natures of these waters - the pinched, shallow channel amplifies the current, causing tidal bores which sweep back into the Bay with unpredictable force. Despite La Pérouse's best efforts, the bodies of the twenty-one lost sailors were never found. On the central island, now renamed "Cenotaph Island", the expedition set up a makeshift memorial, with an account of the incident buried in a bottle. Various monuments have been erected over the years, and in 1871 the Western Union Telegraph Company named several geographical features in the area after the men and ships of the expedition. In 2003 members of the Association Salomon, with detecting equipment, thought that they had a found the original bottle but were prevented from retrieving it by the local Alaskan authorities. There is currently no permanent memorial on the site. In the marquis de Laborde's garden at Méréville, a rostral column by Hubert Robert, originally intended to celebrate the expedition's departure, served as a memorial to his dead sons. 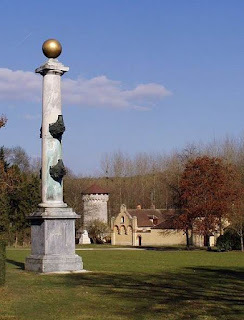 The blue-turquoise marble column, decorated with four ships' bows, can still be seen, resited to the château de Jeurre at Morigny-Champigny near Étampes. In 1788 the Academy of Architecture proposed prize for a design for a centotaph for the island. 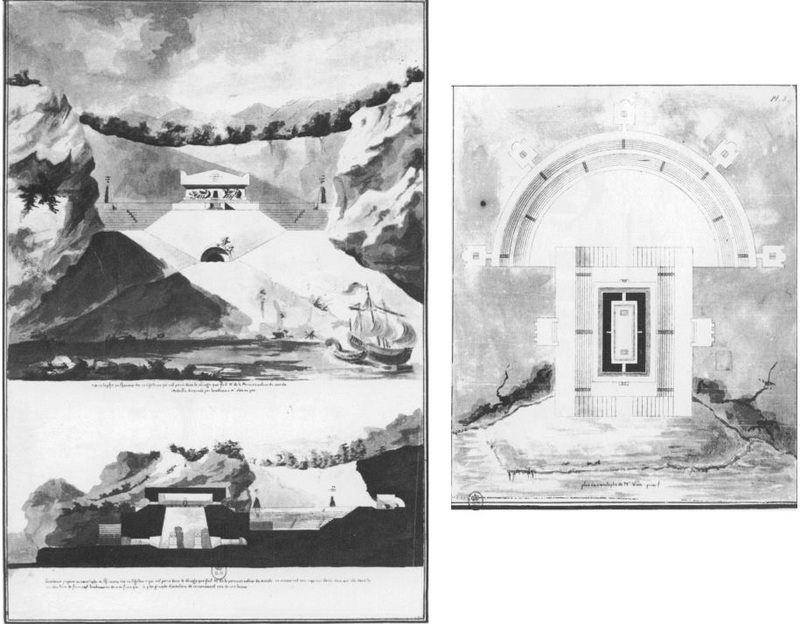 The winning entry by Vien was a tour-de-force of neoclassical visionary design. 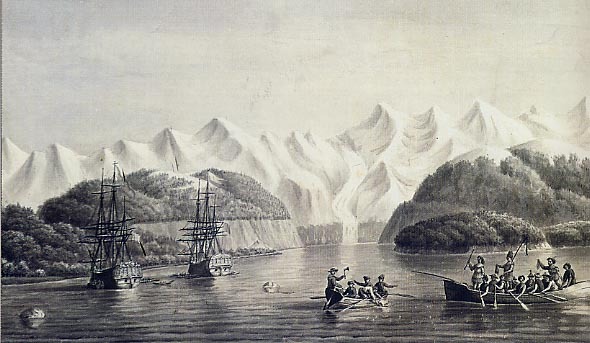 Robert Inglis, "Lapérouse 1786: a French naval visit to Alaska" in Enlightenment and exploration in the North Pacific, 1741-1805, ed. Stephen Haycox, James Barnett and Caedmon Liburd. 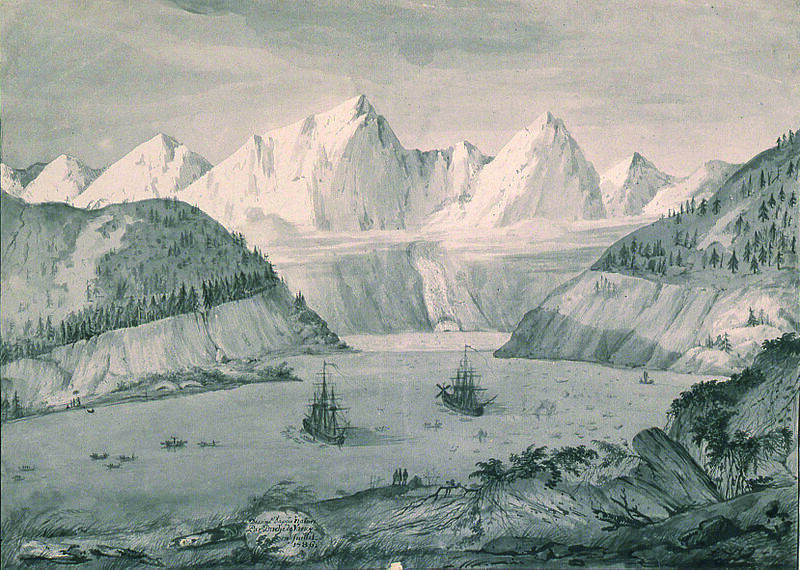 Cook Inlet Historical Society, Anchorage Museum, 1997, p.49-64. "La Perouse at Port des Francais (Lituya Bay)" 22.02.10. Professor Quentin notes that La Pérouse "got off easy" - in 1958 tsunami-prone Lituya Bay experienced the highest wave ever recorded on earth, with a run-up on land of 524 vertical metres. The catastrophe as imagined by Nicolas Ozanne for the French edition of La Pérouse's journal. At ten in the morning I saw our jolly-boat returning. A little surprised, as I did not expect it so soon, I asked M. Boutin, before he got on board, if anything had happened; apprehending at the moment some attack from the savages. The appearance of M. Boutin was by no means calculated to allay my fears. His countenance displayed the most lively sorrow. He quickly informed me of the dreadful loss he had witnessed; and in which he must himself have been involved, had not his firmness of mind enabled him to perceive the resources that were left in such extreme peril. Drawn, by following his commanding officer, into the midst of the breakers, which set into the passage, while the sea ran out at the rate of ten or twelve knots an hour, it occurred to him, to present the stern of the boat to the surge, so that yielding to the wave it might not fill, while it would be drifted out stern foremost by the tide. He soon perceived that he had left the breakers ahead, and found himself in the open sea. More intent on the safety of others than of himself, he rowed along the edge of the breakers, in hopes of saving some of his unfortunate comrades, and he even returned into them again, but was driven back by the tide. At length he got upon the shoulders of M. de Mouton, that he might command a more extensive view; but in vain, all was swallowed up and M. Boutin re-entered the bay at still water. The sea having become smooth, he had entertained some hope of the Astrolabe's pinnace, as he had only seen ours go down. M. de Marchainville was at that time a full quarter of a league from the place of danger, being in as smooth water as in the closest harbour: but this young officer, prompted by a generosity, imprudent no doubt, as, under such circumstances any assistance was impossible, and possessing too much courage and magnanimity to make this reflection when his friends were in such extreme danger, flew to their assistance, rushed into the same breakers, and perished with his commander, the victim of his generosity, and of the peremptory disobedience of that officer's orders. M. de Langle soon came on board my ship, not less overwhelmed with grief than myself, and informed me with tears, that the misfortune was far greater than I had supposed. Since our departure from France he had made if an inviolable law to himself, never to send the two brothers, Messrs. la Borde Marchainville and la Borde Boutervilliers, on the same party; and on this occasion he had yielded for the first time to their wish to take a walk and shoot together, as indeed we both considered this expedition as little more than a party of pleasure, in which the boats would be no more exposed to danger than in Brest Road in fine weather. Some canoes of the savages came now to inform us of the fatal accident. These rude unpolished men expressed by signs, that they had seen both our boats sink, and that to render them assistance was utterly impossible. We loaded them with presents; and endeavoured to make them understand, that all our wealth would not have been too ample a compensation for him who had saved a single man. AT THE ENTRANCE OF THIS HARBOUR PERISHED TWENTY-ONE BRAVE SEAMEN, READER, WHOEVER THOU ART, MINGLE THY TEARS WITH OURS. "On the 4th July 1786 the frigates la Boussole and l'Astrolabe, which sailed from Brest the 1st of August 1785, arrived in the port. Owing to the care of M. de la Perouse, commander in chief of the expedition; of the viscount de Langle, commander of the Astrolabe; of Messrs. de Clonard and de Monti, first lieutenants of the two ships; and of the other officers and the surgeons, the crew had experienced none of those diseases which usually attend long voyages. M. de la Pérouse congratulated himself, as we all did, for having sailed from one end of the world to the other, through dangers of every kind, having visited people reputed barbarians, without losing a single man, or spilling a drop of blood. On the 13th of July, three boats departed at five in the morning, to place the soundings on the plan that had been drawn of the bay. They were commanded by M. d’Escures, lieutenant of a man of war and knight of St. Lewis. M. de la Pérouse had given him written instructions, expressly prohibiting him from approaching the current; but at the moment when he thought himself at a distance from it, he was drawn into it. Messrs. de la Borde, two brothers, and M. de Flassan, who were in the boat of the second frigate, hesitated not to expose their own lives, to assist their comrades. But, alas! they only shared their fate. The third boat was under the command of M. Boutin, lieutenant of a man of war. This officer, bravely struggling against the breakers, made vain but useless attempts to assist his friends for some hours, and would have perished likewise, but for the superior construction of his boat, his enlightened prudence, that of M. Laprise Mouton, lieutenant of a frigate, his second, and the activity and prompt obedience of his crew, consisting of John Marie, cockswain, Lhostis, le Bas, Corentin Jers, and Monens, all four seamen. The Indians appeared to participate in our grief, which is extreme. Affected but not discouraged, by our misfortune, we departed the 30th of July, to continue our voyage." On the 13th of July, ten minutes before six in the morning, I set off from the Boussole in the jolly-boat, with orders to attend M. d’Escures, who had the command of our pinnace; and M. de Marchainville was to join us with the pinnace of the Astrolabe. The instructions given to M. d'Escures in writing, by M. de la Pérouse, which had been read to me, directed him to employ the three boats in sounding the bay; to place the soundings, according to the bearings, on the plan given him; and to sound the passage, if the water were smooth, and measure it's width: but he was expressly charged, not to expose the boats under his command to the least danger, and not to approach the passage, if there were the least appearance of breakers, or even swell. When we had doubled the western point of the island; near which we were anchored, I perceived the passage covered with breakers from one side to the other, and that it was impossible for us to approach it. M. d’Escures was then a-head, lying on his oars, apparently waiting for me; but when I was within musket-shot of him, he rowed on; this he several times repeated; but his boat rowing faster than mine, I found myself unable to join him . At a quarter after seven, having constantly steered for the passage, we were within two cables' length of it, when the pinnace put about, and I followed in her wake. We were then standing towards the bay, leaving the passage astern of us. Our pinnace was a-head of my boat within hail, and that of the Astrolabe a quarter of a league off within the bay. M. d’Escures then hailed me gaily: ‘I believe we can do nothing better than go to breakfast, for the sea breaks terribly in the passage.’ I answered: ‘I think so too; and. I fancy we must content ourselves with fixing the limits of the sandy bay on the larboard of the entrance.’ M. de Pierrevert, who was with was a-head, as vainly attempted to gain the west. We were obliged therefore to lay our heads to the north, that we might not fall broadside to the breakers. The beginning of the surge now appeared at a very little distance from my boat. I thought it advisable, therefore, to let go the grapnel, but it would not hold: fortunately it was not made fast to the thwart, and so ran clear out, thus freeing us from a weight which might have been fatal to us. In an instant I was in the midst of the heaviest waves, which almost filled the boat; yet she did not go down, and still answered the helm, so that I was able to keep her stern to the surge, which gave me great hope of escaping the danger. While I was letting go the grapnel, the pinnace increased her distance from me, and did not get into the breakers till some minutes after me. I had lost sight of her when the sea first broke into my boat: but at one of those moments when I was at the top of a wave, I saw her on her broadside sixty or eighty yards a-head, but could perceive neither men nor oars. My sole hope had rested on her stemming the current; for I was too certain that she would be lost if she were carried away by it; since, to escape, required a boat that would swim when full of water, and answer her helm in that situation, to prevent her from oversetting, qualities of which neither, un- fortunately, was possessed by our pinnace. I was still in the midst of the breakers, looking round me on all sides; and I perceived, that astern of the boat the waves formed a chain extending to the south as far as I could see.— They extended also a considerable way to the west. But I discovered, that, if I could get a hundred yards to the eastward, I should be in a much less dangerous sea. Accordingly I exerted every effort to accomplish this, by pulling to the starboard in the intervals between the seas; and by five-and-twenty minutes after seven I was out of danger, having to contend with nothing but a heavy swell, and some short waves occasioned by the west-north-west breeze. After having baled the boat, I thought of assisting my unfortunate comrades; but my hopes were at an end. From the moment I saw our pinnace going down among the breakers, I had pulled by intervals towards the east, but was some minutes before I could extricate myself from them. It was impossible, that persons wrecked in the midst of such a rapid current should get out of its course, at the mercy of which they must drive the remainder of the tide, which continued to set out of the bay till a quarter before nine: beside, could the most experienced swimmer resist the violence of such waves even for a few moments Still, as I could make search nowhere, with any show of reason, except in the direction of the current, I laid the boat's head to the southward, and rowed along the edge of the breakers, which were on my starboard hand, changing my course every moment after objects I perceived floating, which from time to time gave me hopes, but which, on my approach, proved to be nothing but seals or sea-weeds. As there was a heavy swell, when I was on the top of a wave my horizon was pretty extensive, so that I could have perceived an oar, or a piece of wreck, four or five hundred yards distant. My eyes were soon turned towards the eastern point of the entrance, on which I perceived some men making signals by waving their cloaks. These, I afterwards found, were savages: but at the time I supposed them to be the crew of the Astrolabe's pinnace, waiting for the slack water to come to our assistance. I was far from thinking, that my unfortunate friends had fallen vic-tims to their generous boldness. At three quarters after eight o'clock, the tide being turned, there were no breakers, only a heavy swell. I thought it incumbent on me o continue my search in this swell, following the direction of the ebb, which had ceased ; but I was as unsuccessful in this search as in the former. At nine o'clock, perceiving the floodtide set in from the south-west ; having neither provision, sail, nor grapnel ; my boat's crew wet and chilled; apprehensive that I should not be able to re-enter the bay when the flood had acquired all its force ; finding too, that it already flowed strongly to the north-east, which prevented my getting to the south, where my search should have been continued; I returned to the bay, steering to the north. After these particulars, I conceive I ought to explain the motives of the conduct of M. d'Escures. It is impossible he could ever have thought of entering the passage. His design was merely to approach it; and he imagined he kept himself at a distance more than sufficient to be out of all danger. But in this distance he was deceived, as well as myself, and all the eighteen persons in both the boats. It is not for me to say how far this mistake was pardonable, or why it was impossible to judge of the strength of the current, as I should be thought to be offering my own excuse; for I repeat it, I conceive the distance more than sufficient, and even the sight of the coast, which appeared flying to the north with extreme velocity, only excited my astonishment. Without attempting to particularise all the reasons which contributed to inspire us with so fatal a confidence, I cannot avoid remarking, that, on the day of our entrance into the bay, our boats were above two hours sounding the passage, in every direction, without finding any current. It is true, that, when our ships attempted to enter it, they were driven back by the ebb: but the wind was so faint, that our boats, at the very same time, stemmed the tide with the utmost ease. Lastly, on the 11th of June, when the moon was at the full, our two captains themselves, accompanied by several officers, had sounded the passage, went out with the ebb, returned with the flood, and perceived nothing that could lead them to suspect the least danger,”particularly with boats well manned. Hence it must be inferred, that the violence of the current must have been owing to some particular cause, &S all extraordinary melting of snow,t or strong gales of wind, which had not reached into the bay, but unquestionably blew with violence in the offing. I cannot designedly have omitted any essential fact, or misrepresented those I have related: M. Mouton, who was with me, is here to correct me, if my memory have made any mistake. His firmness, with that of the cockswain and four rowers, contributed not a little to save us. My orders were executed in the midst of the breakers with as much precision, as in the most ordinary circumstances. Signed, BOUTIN.